Trains run every few minutes from 11am to 4.30pm, except where stated. Return fare only £1.50 (Adult), £1 (Children). Demonstration ore trains will also be operated subject to operational demands. The Great Laxey Mine Railway is owned by the Laxey and Lonan Heritage Trust and operated by volunteers. Trains depart from the Valley Gardens in Laxey, which can be reached from Douglas and Ramsey by the Manx Electric Railway, Isle of Man Transport bus route 3 or by car. The above dates and times have been taken from the GLMR published timetable, any query regarding the services or to check for up to the minute details of operations should be directed to GLMR at the above telephone number. Mining for lead and zinc began at Laxey in about 1780. By the mid 1870's the Great Laxey Mine was one of the richest and most successful metal mines in Britain. Shafts had been sunk to depths of over 2000 feet deep and nearly 1000 men, and a few women and young lads, worked at the mine. The main level of the mine was known as the Adit Level, entering the hillside beneath the Laxey Wheel and connecting with each of the shafts deep underground and having a maximum length of nearly 1 and a half miles. A tramway ran along the entire length of the Adit Level and was used to carry the mined ore out of the mine to the Washing Floors where the ore was prepared for sale. The tramway wagons were originally hauled by ponies but in 1877 they were replace by two 19'' gauge steam locomotives built by Stephen Lewin of Poole, Dorset. Named ANT and BEE they remained in use until the mine closed in 1929 and were broken up for scrap a few years later. In 1999, the Laxey and Lonan Heritage Trust began the restoration of the surface section of the former tramway. 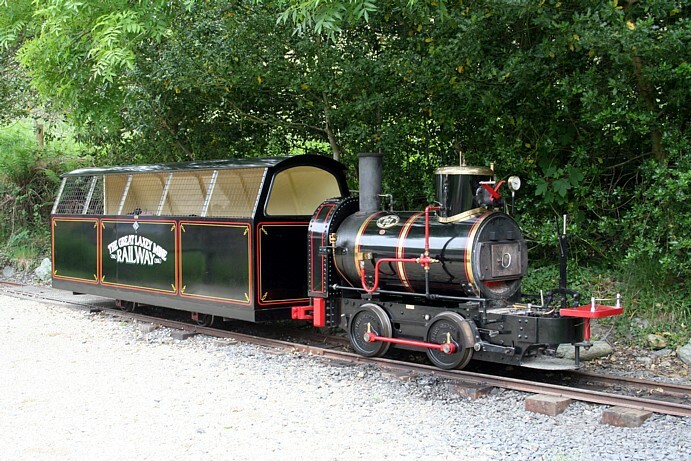 the restored Great Laxey Mine Railway was officially opened in September 25, 2004 with two fully working replicas of the original ANT and BEE. Passengers can now ride in a tiny carriage along the line where loaded wagons of ore were once hauled from the mine. The railway, a quarter of a mile in length, runs up the valley from the former Washing Floors, now the Valley Gardens, to the Adit Level entrance where there is a picnic site, footpath and information boards explaining the mining features. The Laxey Wheel is only a short five minute walk away. The line runs beneath the main Laxey to Ramsey road through the longest railway tunnel on the Island! The Snaefell Mine was situated at the head of the Laxey Valley on the lower slopes of Snaefell Mountain. In 1865 a 50 and a half foot diameter waterwheel was built by L & G Howell of the Hawarden Ironworks in Flintshire to pump water from the mine. When the mine closed in 1908, the waterwheel was rebuilt in Cornwall. In the 1970's the components of the wheel were preserved by the Trevithick Society. The Laxey Mines Research Group, in conjunction with the Laxey and Lonan Heritage Trust, reached agreement in 2003 with the Trevithick Society to return the components to Laxey and re-erect the waterwheel at the Valley Gardens. Restoration work will be completed in 2006. A waterwheel at each end of the railway!